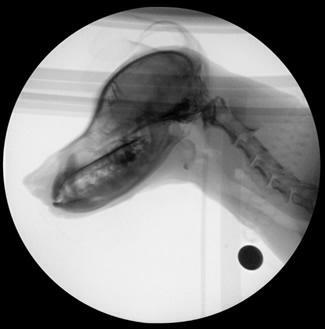 Was your dog just diagnosed with megaesophagus, a dilated flaccid esophagus which lacks muscular contraction? The esophagus, the tube that carries food and water from the mouth to the stomach, can become inappropriated dilated, causing food to be regurgitated (not vomited!) back up. With regurgitation, there is no “warning” or retching – food or liquid just “blurbs” back up suddenly. Unfortunately, megaesophagus can shorten the life-span of dogs, as it can cause secondary aspiration pneumonia chronically. BTW, veterinary professionals, here’s a great article by DVM360 on this disease here. Pet owners, here’s a great article by board-certified veterinary internists at PetPlace.com here. Well, there may finally be a some good news. In a recent press release by the Veterinary Health Center (VHC) at the University of Missouri’s College of Veterinary Medicine, they have a new approach to treating one type of canine megaesophagus. Check out the press release below on the use of botox to help treat this! A partnership between the VHC’s Small Animal Internal Medicine, Radiology, Surgery, and Nutrition services and an investigator in the Otolaryngology-Head and Neck Surgery department at the university’s School of Medicine has resulted in the discovery of a breakthrough treatment for a subpopulation of dogs with megaesophagus. The Mizzou team has identified a defect of the lower esophageal sphincter (LES) as a potential treatable cause of megaesophagus. Megaesophagus (ME) refers to a large, dilated esophagus with poor or no motility preventing normal passage of food and liquid into the stomach. With ingesta not reaching the stomach to produce the sensation of being full, the dog will continue to eat. As a result, the esophagus enlarges greatly. Dogs end up not getting enough calories so they waste away. Dogs with ME also regurgitate large amounts of undigested food and some of that material can be inhaled into the lungs. This inhalation can result in aspiration pneumonia, a dangerous additional symptom that kills many affected animals. The LES acts as a valve between the esophagus and the stomach, opening when food and water are swallowed, then clamping tight so food doesn’t come back from the stomach into the esophagus. In dogs afflicted with megaesophagus caused by an achalasia-like syndrome, the LES remains closed. “Video fluoroscopic swallow studies have been around a long time,” Reinero said. “The problem with prior protocols is they did not represent normal eating and drinking behaviors. Those tests had very little to do with reality. A dog had to be restrained, lying on its side, and syringe-fed barium, which was not palatable even when mixed with food. If dogs don’t eat during the swallow study you’re not going to get a diagnostic study.” In order to receive a better diagnostic result, the Mizzou collaborative research team blended innovation with adaptation, developing new techniques and tools while borrowing procedures from human medical practices to diagnose and treat this type of canine ME. During a patient’s recovery, residents in the Nutrition Service monitor the dog’s weight and food intake. The amount of food an owner may give a pet might need to be altered every couple of days. James Schachtel, Bvet Med, MRCVS, is a Radiology resident and key collaborator in the study. “This approach gives these dogs a chance, whereas a lot of them didn’t have much of one,” Schachtel said. “At this time, it is early in the evaluation process, but it’s a novel approach that shows promise. “This subpopulation can receive a really significant benefit from our direct ability to detect their malady. It can give them a really good quality of life. This is a revolutionary diagnostic technique for a disorder identified with a pathological outcome. It offers us the opportunity to use therapies that have been successful in people, so we’re optimistic we can experience similar success with canines,” Schachtel said. Schachtel will present an oral abstract of the swallowing protocol and early identification of the LES achalasia on Oct. 20 at the American College of Veterinary Radiation Annual Scientific Conference in Orlando. My jack Russell pokey was diagnosed as a pup. He will be 14 tomorrow. He will be celebrating his 14th birthday tomorrow. Megaespagus is NOT a death sentence. He had an xray and ultrasound yesterday, he has a few issues, heart murmur and slight calcification on liver. Vet says for his age and with megaespagus he looks good. O reading this makes me more confident that our dog will live a heathy life. He was just diagnosed with megaespagus today. I have done some research finding some scary stuff and some reassurance. If you have any suggestions for me please send them my way. My dog suffered for four years before we figured out what he had. The bailey chair has saved his life! I highly reccomend feeding your pup in one. Also before bed we put a pillow (like the one people were on airplanes) on him to keep his head elevated. The improvements have been amazing! How do you keep his head on the pillow? I have a two year old Goldendoodle which was diagnosed at six months. She has a problem at night because of the water she has drank after dinner. I do not put her in the Bailey chair when she drinks water and I believe this is the problem…..she is lying flat in her bed.